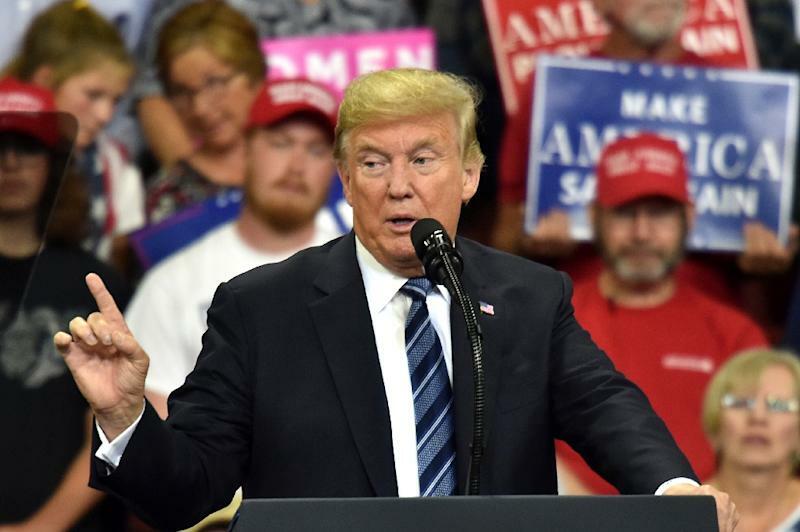 Fargo (United States) (AFP) - US President Donald Trump on Friday urged his attorney general to investigate the anonymous author of a damning op-ed, escalating his long-running battles with both the media and leaks from the White House. "I would say Jeff (Sessions) should be investigating who the author of that piece was because I really believe it's national security," Trump told reporters traveling with him in North Dakota. "The Times should never have done that, because really what they've done is virtually, you know, it's treason," the president said in an interview with Fox News broadcast earlier Friday. A "whodunnit?" style guessing game has raged in the corridors of power and on social media over the identity of the author, prompting nearly every cabinet-ranked member of the government to deny involvement. "We have thousands of people that, in theory, could qualify," Trump told Fox, describing the author's anonymity as "very unfair," since it prevented them from being openly scrutinized. The article, which was published on Wednesday, said "unsung heroes" were quietly working within the administration to frustrate the president's "worst inclinations." That account was also supported by Woodward's book, which Trump dismissed on Twitter as a "scam." "I don't talk the way I am quoted. If I did I would not have been elected President. These quotes were made up. The author uses every trick in the book to demean and belittle," Trump tweeted. "I wish the people could see the real facts - and our country is doing GREAT!" Woodward's "Fear: Trump in the White House," a 448-page account of an out-of-control administration set to hit bookshelves next week, draws on hundreds of hours of insider interviews. Attacking the veracity of the quotes attributed to Trump and his lieutenants in "Fear" has been a central plank of the administration's attempt to discredit Woodward. But Trump's insistence that the words attributed to him are "made up" hasn't always stood up to scrutiny. While Woodward does not name his sources, he says he spoke with many people currently or formerly working for Trump, discussing not just the president's personality but also major policy debates regarding North Korea and Afghanistan. The book depicts Trump aides working to head off potential foreign policy disasters, disregarding a call by the president for the assassination of his Syrian counterpart, and stealing an order that would have canceled a US-South Korea trade agreement.